Earlier this week, I was delighted to attend Fashion and Beauty Week 2011 with a select group of bloggers. The folks @ Fashion & Beauty Week made sure the event was stylish from the start- we were picked up from Manhattan in a limousine and whisked away to the foreign land of New Jersey (hahahaa I'm no stranger to the state- I actually went to college in Jersey). 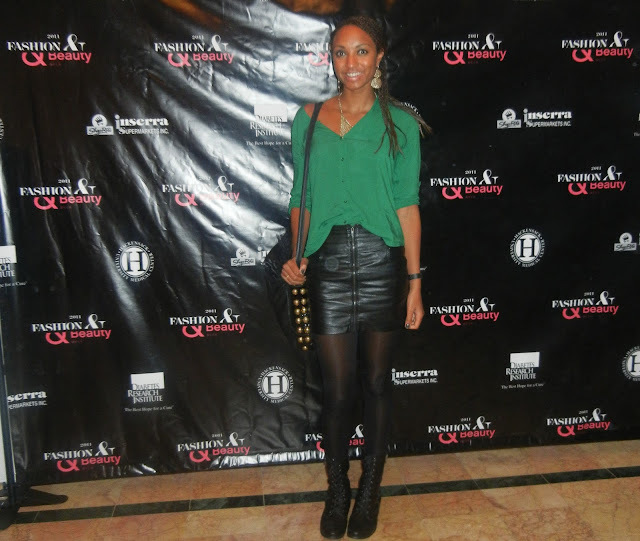 I was really impressed by what a well orchestrated event NJ Fashion & Beauty Week was. The venue was quite opulent with high ceilings, crown molding, a spacious ballroom, and cavernous nooks- really a beautiful place to host any event. The night was grandiose too! It included a full cocktail dinner, wine tasting, beauty bar, silent auction, lounge areas, and celebrity guests. The fashion show lasted nearly an hour and was definitely one of the longest that I had ever been to, a stark contrast to the 13-minute-long fashion shows of NY Fashion week. Collections were shown from both emerging and well-established designers. Common among all of the collections was wearability. Models weren't parading down the runway looking like reindeer or aliens. Everything was high fashion, chic and ready-to-wear. I loved that models represented the spectrum of races, ethnicities and sizes. Sometimes you go to fashion shows and everyone walking is an anorexic ghost from Sweden. Kudos to the NJ Fashion & Beauty Week designers for not using that cookie cutter! In all, this was a great event not only because I love fashion, but because it raised money and awareness for the Diabetes Research Institute. I'm already looking forward to attending next year! Loved your look! so rocker chic! !